Going out this weekend in Brissie? Here’s my experience of four contrasting bars from my recent trip. Thursday– the Royal Exchange, Toowong. Beloved of students at the nearby University of Queensland or UQ, not to be confused with QUT or several other combinations involving the letters U and Q. Terrible pop music blared from speakers with no bass response. No sooner than I remarked that it was like a teenage girl’s party, Whigfield’s Saturday Night played followed by Dr Jones. The music suited the clientele, but the beer was incredibly cheap. Verdict: 3 beers, cheap and cheerful. Friday night on downtown Eagle Street Pier, following a corporate function at Custom House, saw us at Fridays. A twenty minute wait at the bar- during which drunk girls in unseasonably short black dresses and their less dapper but equally drunken boy-folk crashed into and pummelled us- yielded two expensive beers. At least I assumed they were as my friend bought them. Verdict: one overpriced beer. Get me out! Saturday night we were at the Joynt, behind South Bank. Sadly this was its second-to-last night. Crammed with young and old, original live music in its tiny front bar. Hipsters, hippies, alternatives, it felt like Adelaide’s wonderful Grace Emily Hotel, or Brixton’s Hootenanny. Smoldering, steamy blues-rock with crunchy guitar and crunchier vocals from the gender-challenged duo Mojo Juju (we later confirmed on Wicki that she was a girl). Even their cover of Billy Jean oozed swampy sexiness. Verdict: lost count of the beers and one Bundy and coke. Gutted they’re closing. Best place in town. 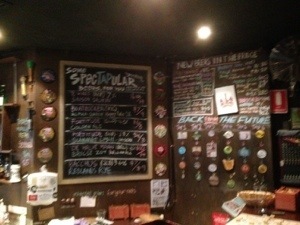 The beer specials board at Scratch. Finally before flying home on Sunday a swift pint – they call it a schooner here – at the Scratch Bar in Milton. Craft ales, free-in-their-shells peanuts -or freenuts, knowledgable bar staff, comfortable seating, more sophisticated but still casual, this is an ideal place to meet friends and chat. Verdict: would have had much more than one beer, but had plane to catch.